The contemporary urban condition in the Philippines demands critical attention in terms of theory and practice. Accompanying the new urbanization is a malevolent geography structured around historical processes of elite accumulation by subaltern dispossession. The task at hand is to expose these spaces to make critical provocations on urban theory and practice. The author will argue for a processual approach that accounts for the minutiae of everyday life in relation to broader economic, political, and social processes, going beyond tendencies to categorize state-delimited territories as urban from rural or promoting techno-managerial interventions. The lecturer will emphasize neoliberalization as a productive entry point that instigates multiple transformative processes, whereby market-oriented projects and ideologies congeal and intertwine with, and are exceeded by, other context-specific processes. Manila’s mega-urbanization illustrates these multiple negotiations; from public-private partnerships in the township development to the transnational flows of remittances fueling real estate transaction. Given the scale of displacement in the wake of neoliberalizing development, we must generate urban scholarship that is transdisciplinary and theoretically innovative and also grounded on solid data. More importantly, we must likewise explore multiple interventions and creative partnerships that engage in participatory work and co-produce knowledge that foregrounds the concerns of the marginalized poor. Andre Arnisson C. Ortega a human geographer and critical demographer whose interests lie at the intersection of urbanization and migration. His research examines contested production of urban spaces, particularly in how transnational mobilities of migrants, capital, and ideas have spurred accumulation by dispossession in the Global South. Through an interdisciplinary lens and feminist perspective, he uses mixed methods and participatory approaches that meld qualitative and quantitative methods to expose spaces of inequality and dispossession and to foster solidarity. As a scholar committed to social justice, Andre is interested in developing creative ways of translating knowledge into practice and in actively engaging in participatory action research projects with marginalized populations. He is currently spearheading a counter-mapping initiative with scholars, artists, and activists in the Philippines. His articles have appeared in the Annals of the Association of American Geographers, Urban Geography, Cities, Geoforum, among others. 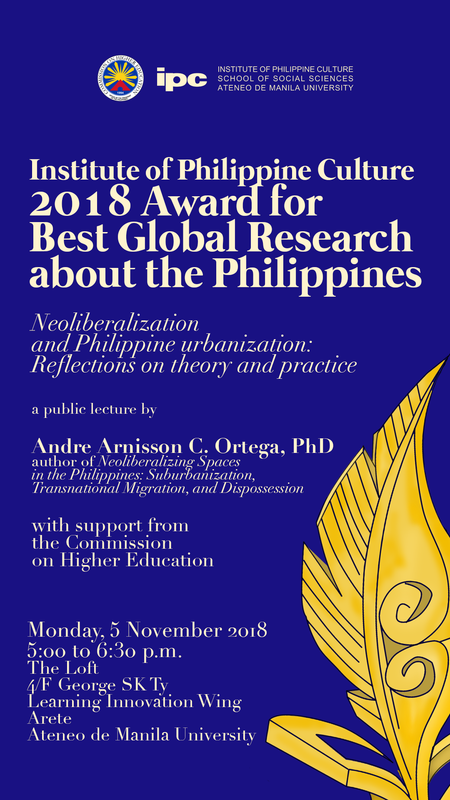 He recently published a book entitled “Neoliberalizing Spaces in the Philippines: Suburbanization, Transnational Migration, and Dispossession” under Ateneo de Manila University Press. Andre is currently a research fellow at the University of Glasgow. He received his Ph.D. at the University of Washington in Seattle, USA and taught at the University of the Philippines, Diliman for several years. He was also an Urban Studies Foundation fellow at York University in Toronto, Canada.